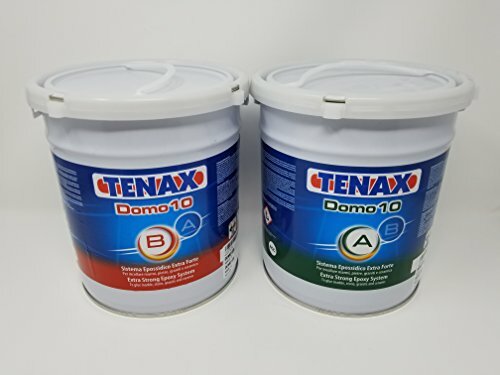 TENAX DOMO 10 CARTRIDGE Domo 10 A & B is a two part knife grade epoxy designed for all types of stone and will bond almost any surface. Even polished surfaces can be bonded with Domo A & B. It is designed for permanent application and works very well on a variety of surfaces including: Dry Surfaces Polished Surfaces Damp Surfaces Domo is one of the strongest epoxies in the industry and will create a bond that is so strong that the stone will break before it will. The following are characteristics of Domo 10 A & B: White in color VOC compliant For indoor and outdoor use Suitable for temperatures below 32° Suitable for extreme heat APPLICATION Domo 10 is used to glue and repair the following materials: Natural Stone Ceramic Composite Stone Concrete It is also used to glue several different materials to one another: Ceramic Stones Metal-Stones (metal properly scrabbled) Metal-Ceramic (metal properly scrabbled) Metal-Concrete Glass-Stones (glass properly scrabbled) Glass-Ceramic (glass properly scrabbled) Ideal also for fixing nail and metal parts and anchoring pivots, bolts, and tie-beams. COMPANION PRODUCTS This Domo10 cartridge system requires the M200XMR Cartridge Gun for use. SHELF LIFE Keep the containers closed after use. Keep away from heat, humidity and sun light. This product will last 2 years under normal conditions between 65° and 77°. SAFETY RULES Please read the safety data sheet before use and follow the product instructions. Slow curing epoxy. Domo 10 A & B is a two part knife grade epoxy designed for all types of stone and will bond almost any surface. Even polished surfaces can be bonded with Domo A & B.
Domo is one of the strongest epoxies in the industry and will create a bond that is so strong that the stone will break before it will.